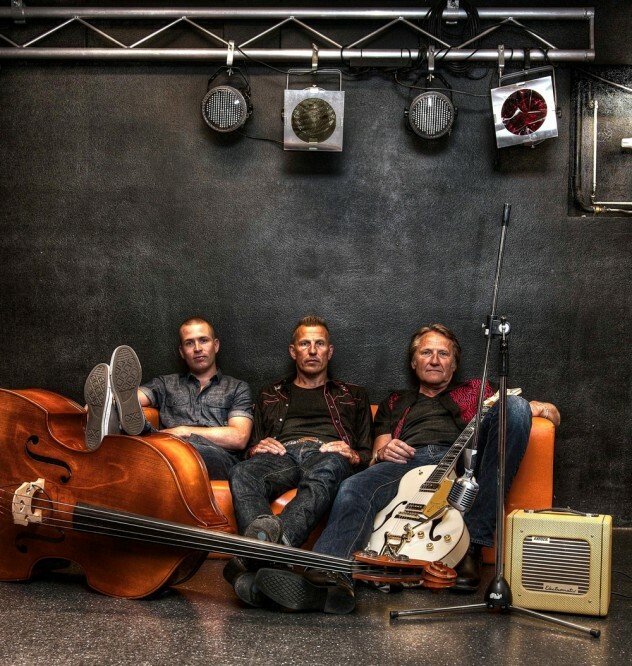 Formerly a duo and now a trio, Hot Rod Double provide their own interpretation of rockabilly music via their eponymously titled debut album. The transition from bluegrass and country music was a relatively easy process for highly regarded and hugely talented musician, Terje Kinn. After a longstanding association with said genres, and wheeling out the banjo for the majority of his years to date, it was time for a change. By crossing the (southern) border to the genre of rockabilly with its links to country music (to name one influence), setting up a whole new project under this hot rockin’ category was therefore straightforward for Terje Kinn, considering the wealth of experience garnered over the years recording and performing live. The necessity for change from country to rockabilly also stemmed from a desire to finally unpack the Gretsch guitars and plug in and crank up the volume to max à la Marty McFly (Back to the Future) and let the neighbours know that there’s still life in this experienced soul. Not to suggest that there is a hint of a midlife crisis afoot here, far from it, but more to do with a restlessness that had started to creep in through the backdoor as far as the creativity went, and hence this newly found vision to help combat any disquiet felt by trading the banjo for one of the major tools of rock ‘n’ roll with the guitar. In order to really set this new project ablaze, however, the skills of Aleksander Haugland Ormvold on upright bass and Bjørn Haglund on drums were brought into the fold, with a chance meeting and then friendship being struck with the former musician much earlier when assembling Hot Rod Double as Terje Kinn continued to explain from his home in Moss, Norway. So Hot Rod Double actually started out as a duo? “We were just playing around here,” answers Terje and then going on to add. “We didn’t do any major jobs, but we played a couple of clubs and some outdoor gigs. People also called us and asked if we could open up some conventions and stuff like that. Lots of weird, weird situations,” he finishes laughing. Was it from this partnership with Aleksander Haugland Ormvold that you developed a shared desire to perform rockabilly music? Did it suddenly dawn on you after a year that you could transform the duo into a trio? Considering your lengthy CV having been a part of the music scene in Norway for some time, is this the first ever rockabilly record that you have made in terms of ‘Hot Rod Double’? When you were writing the songs for your debut album with Hot Rod Double, there must have been a lot of musical sources to choose from considering your background in terms of bluegrass and country music? In terms of Hot Rod Double how would you describe your sound? 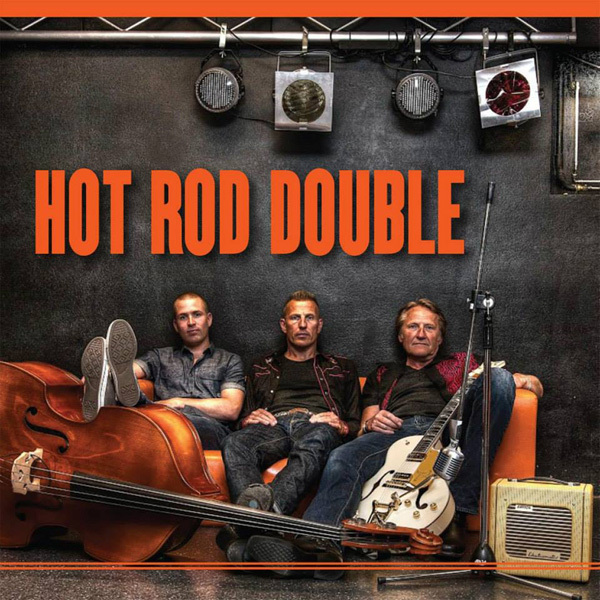 It is certainly true the manner in which Terje Kinn describes Hot Rod Double’s set up and sound because visually they fit the mould of a typical rockabilly line-up, but musically the band’s debut album allows for a few other reference points from country to sixties-sounding instrumentals, such as the jaw-droppingly good ‘A Minor Breakdown In E Minor’ that earmarks their sound as one willing to adopt broader influences, but one that is not strictly rockabilly in the traditionalist sense. Can you provide some background details regarding the making of your debut album ‘Hot Rod Double’? “We recorded in April 2015,” begins Terje regarding the band’s recording of their very first album. “The guy who owns the record company has a studio in his house, so he recorded it. 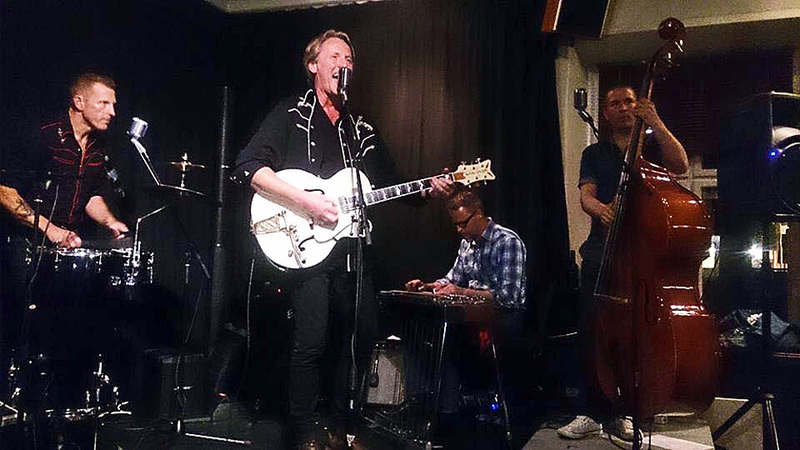 His name is Tore Blestrud, and he’s the guest musician who plays the steel guitar and lap steel on the record as well. So we went to his place and played all the songs the first day, with the intention of recording everything that same day. Everything was played live. We just plugged in and played and recorded everything. What pleased you regarding the recording of these songs for the album? It sounds like the whole recording experience for your debut album went rather well. However, apart from the aforementioned problems in the guitar department to begin with, did you experience any other problems whilst recording ‘Hot Rod Double’? Is that one of the difficulties when recording that you don’t overdo it by trying to rework every single song? Is that because you’re improvising a bit when you’re playing live? Out of interest, which songs are you referring to here? With the song writing resting solely at the feet of Terje Kinn when it comes to Hot Rod Double, the topics covered in terms of the lyrics are not the archetypal rockabilly themes of driving fast cars, partying hard and chasing the female species. Hot Rod Double certainly like to examine issues a little deeper with one song, ‘Looking The Other Way’, being a rather sensitive and darker tale that Terje Kinn remains somewhat guarded when quizzed about. Do you enjoy the responsibility of being the chief songwriter? The song ‘I’m So In Love Without You’ is one particular track that definitely works on various levels. So the song isn’t specifically referring to your own existence? 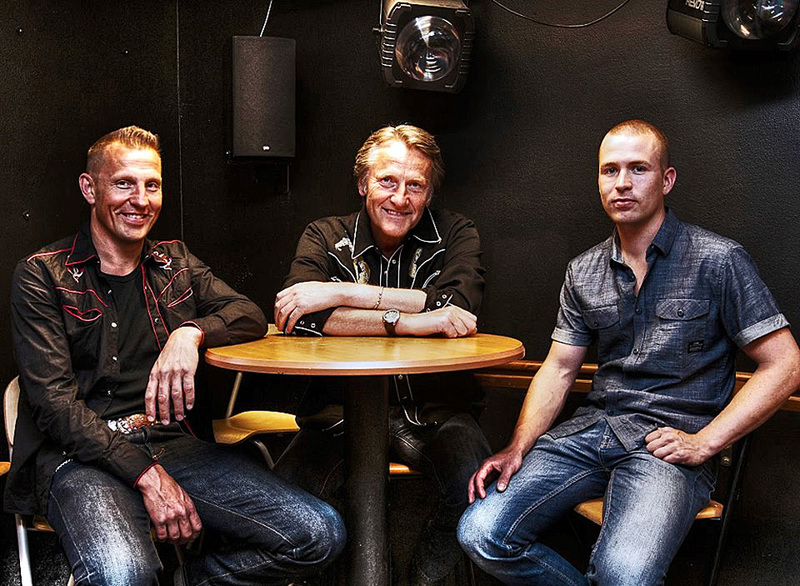 The Hot Rod Double album is not all about the song writing of Terje Kinn though, as there are a few covers that makes for a fine combination considering the musical background of this rockin’ trio’s frontman; hence the choice of covers ranging from Ricky Van Shelton (‘Love Is Burnin’) and Merle Travis (‘Cannonball Rag’) for example. With Hot Rod Double relishing the prospect of entering the recording studio once more after a positive reaction to their debut album by the general public in Norway, Terje Kinn informs FLW of the philosophy that this rockin’ trio lives by in order to produce the music that they want to make. We try to be honest in our music. I don't know if that's the right way to say it, but we like real music if you know what I mean?" Lead vocalist and guitarist, Terje Kinn, of Hot Rod Double talks about hometown gigs, Gretsch guitars and reveals the location of the band’s album cover. There’s a very nice Gretsch guitar sitting there as well!